The macula is the retina's anatomical structure responsible mainly for central vision (the vision we use to read, watch television or recognise faces). A macular hole is a defect or break in the tissue located in the centre of the macula (fovea) that causes a defect in central vision (scotoma) or a blurred zone in the centre of the visual field. Macular holes are usually related to age, although they can also be secondary to eye injury. * Full macular holes: affecting all the layers of the retina and involving greater sight loss. * Lamellar macular holes: affecting only some layers of the retina and not so much the vision. These can sometimes be associated with epiretinal membranes. The vitreous humour is attached to the retina. With age, this degenerates and can end up contracting and becoming detached from the retina. One of the areas to which it is most firmly attached is the macula and, when these contractions occur, they can cause a macular hole. 1. Patients with myopia greater than six dioptres. 2. Patients with eye injuries. 3. 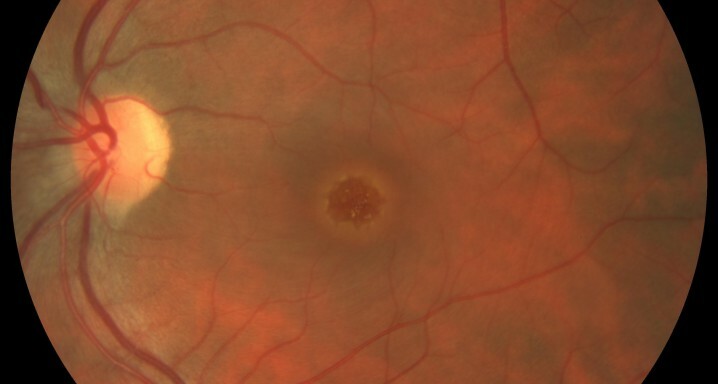 Patients who have had a macular hole in their other eye (10-15 % greater risk). Macular hole symptoms start gradually. At the initial stages central vision can be slightly distorted or foggy. As the condition progresses, vision gets worse and distortion can be noticed in straight lines and especially a loss of the ability to read. At the end of the process it may become very difficult to carry out any task requiring central vision with the affected eye. A thorough ophthalmological examination is crucial, which also includes the following tests: a retina scan, autofluorescence, optical coherence tomography and, occasionally, a microperimetry test. Although some macular holes in their initial stages can close up on their own, the vast majority of the cases require keyhole surgery. The surgical procedure consists of carrying out a posterior vitrectomy to remove the vitreous gel from inside the eye, eliminate the posterior hyaloid and dissect and extract an extremely thin membrane called the inner limiting membrane to help the retina relax so that the edges of the macular hole can rest again on the pigment epithelium. The eye is then filled with gas to maintain pressure on the retina and help the macular hole to close. Surgery is carried out under local anaesthesia, so that patients can return home after the procedure. The Institut de la Màcula has state of the art technology to treat macular holes. The latest innovations in the field of vitreoretinal surgery ensure we have a very high rate of anatomical macular hole closure.